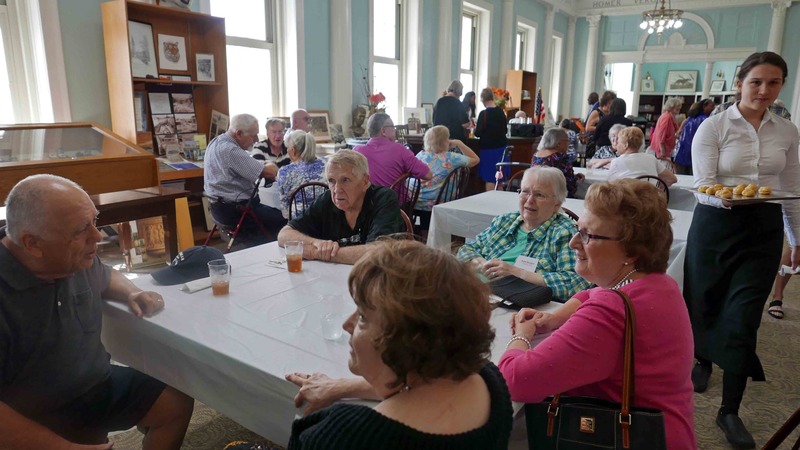 On September 1, 60 retired Withrow staff members gathered in the Alumni Center, which most remembered as the library, to kick off a year of events the Alumni Assn. has planned to celebrate Withrow’s Centennial. Along with socializing and reminiscing about their days at Ohio’s most beautiful public school, attendees enjoyed browsing through artifacts, lunch by Eatwell Catering, background music played by Withrow’s string ensemble, a welcome message from new principal Jerron Gray, and tours of the renovated school. Withrow has changed since the last time many of the former staff visited the campus. To help attendees find their way around, several Withrow seniors volunteered their time to serve as guides and elevator operators. Based on thank-you letters we received, the event was a great success. “It made my heart happy to reconnect with former colleagues and to be inside our spectacular building,” said one retired teacher. From another retiree, “Everything was perfect, from the senior students who greeted us to the wonderful meal.” Said another, “What friendly and helpful students . . . It was wonderful to enjoy good food and conversation . . . Withrow is a gem and coming back reminds me how blessed I was to have spent so many good years there. Initiating the Centennial Celebration by treating the retirees is a small way of thanking them for their contributions to student and alumni successes. A slideshow of photos from the event can be viewed by clicking HERE.